Descartes has acquired PCSTrac, a leading US-based provider of mobile solutions to improve collaboration between retailers and their logistics service providers. US-based PCSTrac provides pool distribution and mobile solutions that help specialty retailers and their logistics service providers collaborate to improve replenishment and carton-level visibility for shipments from distribution centers (DCs) to stores. PCSTrac’s solutions provide visibility and insight into the store replenishment supply chain, helping increase sales, enhance loss prevention, and improve inventory control. Expands Descarte’s community of specialty retail customers and associated logistics service providers. Descartes’ GLN is the foundation on which the applications and community are built. The GLN provides community members the flexibility to easily connect and collaborate with global trading partners. The PCSTrac acquisition will add scale to Descartes’ network-based services through additional order, shipment, status, and invoice connectivity between retailers and logistics service providers. Descartes’ product strategy is focused on expanding its logistics application functional footprint to provide its customers with the most comprehensive logistics management solutions in the industry. PCSTrac has been building its comprehensive solutions for over 15 years. The acquisition will strengthen Descartes’ transportation management and mobile applications with deep pool distribution, cross docking, mobility, and carton-level status tracking solutions. Descartes’ logistics community is the largest multimodal network of logistics intensive companies in the world, with parties using its cloud-based services in over 160 countries. 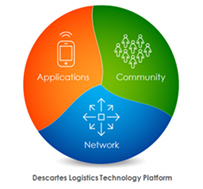 Descartes’ mission is to create the world’s most comprehensive networked logistics community. PCSTrac adds a loyal customer base of specialty retail customers and associated logistics service providers with pool distribution capabilities to Descartes’ community. US-based PCSTrac helps specialty retailers and their logistics service providers collaborate to improve carton-level visibility for shipments from distribution centers (DCs) to stores. PCSTrac’s solutions provide visibility and insight into the store replenishment supply chain, helping increase sales, enhance loss prevention, and improve inventory replenishment. Logistics service providers use the system to improve efficiencies and customer service levels with solutions that are pre-configured to meet each retailers’ delivery compliance expectations. Like Descartes’ Bearware platform, PCSTrac also supports pool distribution, which helps retailers reduce logistics costs and minimize store disruptions by eliminating unconsolidated direct shipments from suppliers and retailer distribution centers into the stores. The acquisition makes PCSTrac’s customers members of the world’s premier global logistics community – The Global Logistics Network – facilitating improved performance and productivity of logistics operations around the world. As part of this community PSTrac’s customers will have access to additional solutions via Descartes’ Logistics Technology Platform to improve rate management, dock appointment scheduling, transportation management, routing and scheduling, and in-transit inventory visibility. PCSTrac is based in Philadelphia, Pennsylvania. Visit the PCSTrac website at http://www.pcstrac.com/.